There are plenty of portable computer options out there already – laptops, netbooks, tablets and mobile phones spring to mind – but those weren’t good enough for Stephen Popa of Portland, Oregon. 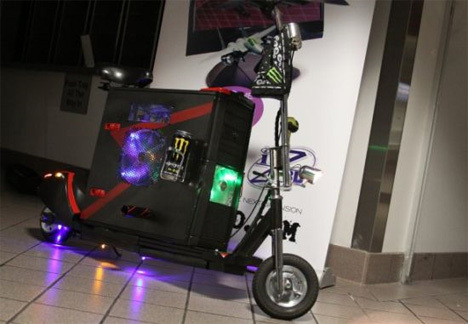 He wanted to take the full computing power of his desktop computer along with him, so he created the Scooterputer: the world’s first ride-on computer. 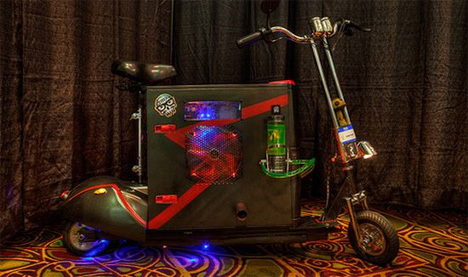 The crazy case mod includes a water-cooled computer with all of the gaming power you need to take your games on the road, mashed up with a 24V rechargeable scooter that can be ridden just like any other scooter. Components of the Scooterputer’s body came from several different scooters and have been modified to all work together. LED ground effects make the ride look totally sweet and even counteract the geekiness of riding around on a scooter made of a computer. See more in Computers or under Gadgets. February, 2011.